In India's Sundarbans, People And Tigers Try To Coexist In A Shrinking Space : Parallels The vast patchwork of islands on a delta where three rivers meet is home to hundreds of tigers and 4 million people. As climate change squeezes the land they share, is increased conflict inevitable? 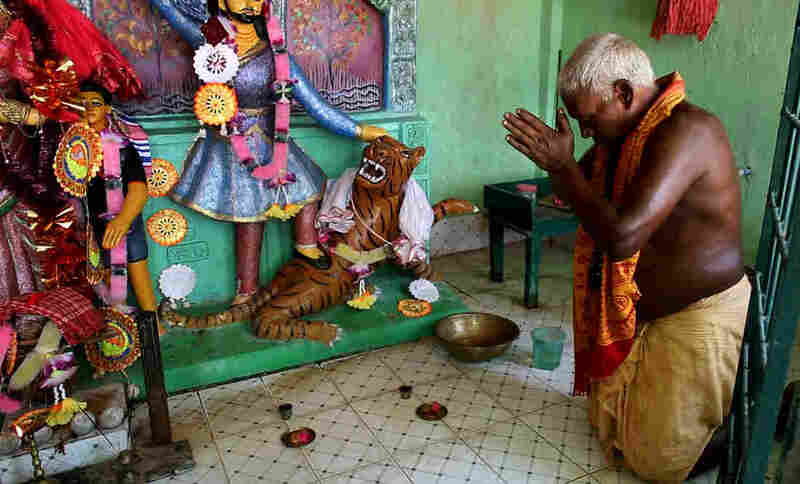 In a remote corner of eastern India, far in the jungle and hours by boat from any village, there is a camp with a brightly colored shrine to a forest goddess. Behind a tall fence, a statue of Bonbibi wears silks and garlands, with a gold headdress. She shelters a boy from a tiger. Every day, forest guard Bhabotaron Paik prostrates himself before the goddess and makes an offering of sweets before he goes out on patrol. When he has finished the ritual — the puja — Paik explains that protection from Bonbibi comes with conditions. "We will not take more than we need from the jungle. That is our vow to the goddess." The goddess Bonbibi — revered by Hindus, Muslims and Christians alike — reminds people here to live lightly on the land. But the landscape is changing, despite the people's small footprint. Climate change has started to reshape some parts of this place, the Sundarbans, where three major rivers — the Ganges, Meghna and Brahamaputra — blend into the Bay of Bengal and tides smudge the boundaries between land and water. It's a patchwork of islands, some as small as sandbars, others miles long. And it's home to the world's largest mangrove forests, nearly 4,000 square miles stretching across India and Bangladesh, full of trees that survive on the border of land and brackish water. "There are no borders here to divide freshwater from salt, river from sea. The tides reach as far as 200 miles inland, and every day, thousands of acres of forest disappear underwater, only to reemerge hours later," author Amitav Ghosh wrote in his 2004 novel, The Hungry Tide. The islands that make up the Sundarbans — the name means "beautiful forest" — are home to 4 million people. They're also home to nearly 200 Bengal tigers. Unlike most big cats, Bengal tigers are happy in water and swim for miles from island to island. But they're elusive. "The first time I saw a Bengal tiger in the Sundarbans, it was some 45 years after I'd first been there," says Bittu Saghal, a conservationist and the editor of Sanctuary Asia magazine. "So you only see them when they decide that you're good enough to be given a vision of orange and black." Not everyone wants to see them. People here have been eaten by tigers. The forest rangers who protect this habitat put their lives at risk every day. Locals keep telling me that tigers here are so stealthy that if I see one, it will only be as its jaws clamp down on my neck. They don't smile when they say this. At the Netidhopani camp, on the western edge of the forest reserve, the most recent tiger sighting was just yesterday, around high noon. I meet forest guard Debnath Mondal. A long scar runs from his left ear down his jaw. His mouth is pulled to the right, near his cheek. "It was the first of June, 2010, at 8:15 in the morning," he says, starting to tell me about how he got those scars. Two weeks before, a team had gone out to attach a radio collar to a Bengal tiger. Mondal himself put the tracker on the animal. He believes the tiger remembered that, and hunted him down. 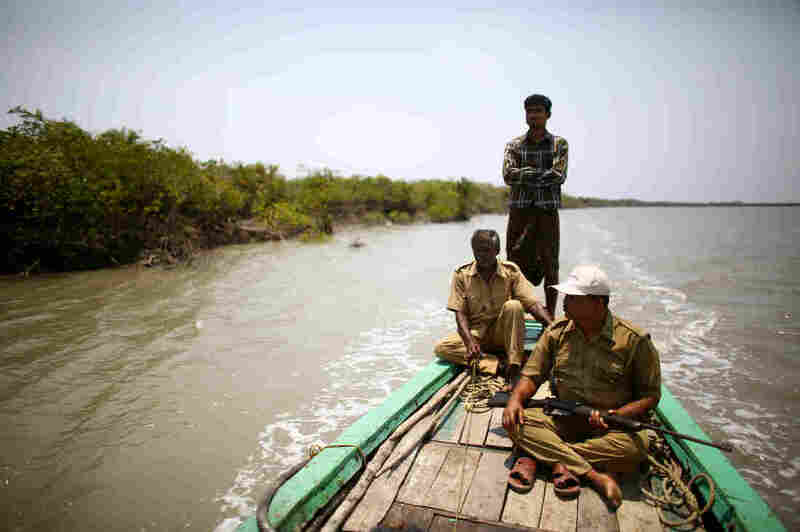 Debnath Mondal (front right), who survived a tiger attack in 2010, patrols the banks of the Sundarbans tiger preserve with another forest guard and a boat skipper. On that morning six years ago, his team of about a dozen men left the camp to visit a nearby watering hole, intending to take the data card out of a camera trap there. The radio collar on the tiger was sending GPS signals to a tracking center thousands of miles away in northern India. If someone had been watching those signals, he would have seen the blip of the tiger on the screen, slowly creeping through the forest to the watering hole where the men were working. The forest guards stood in a circle, facing out, scanning the trees for movement. And then everything happened very fast. "I saw the tiger coming in. Everyone shouted, 'Tiger!' But before I could do anything, it pounced on me. It landed on my thighs and chest and bit my face and head," Mondal says. He takes his hat off and shows me the line on his scalp where the tiger tore at him. "I had 80 stitches in my scalp. I can no longer see out of my left eye or hear out of my left ear." Debnath Mondal was attacked by a tiger in 2010. "I saw the tiger coming in. Everyone shouted, 'Tiger!' But before I could do anything, it pounced on me. It landed on my thighs and chest and bit my face and head," he says. Though seriously injured, he continues to work as a guard in the national park in the Sundarbans. The forest guards fought the tiger with their bamboo poles until it ran away, and they rushed their bleeding friend to a speedboat to take him to the hospital, hours away. 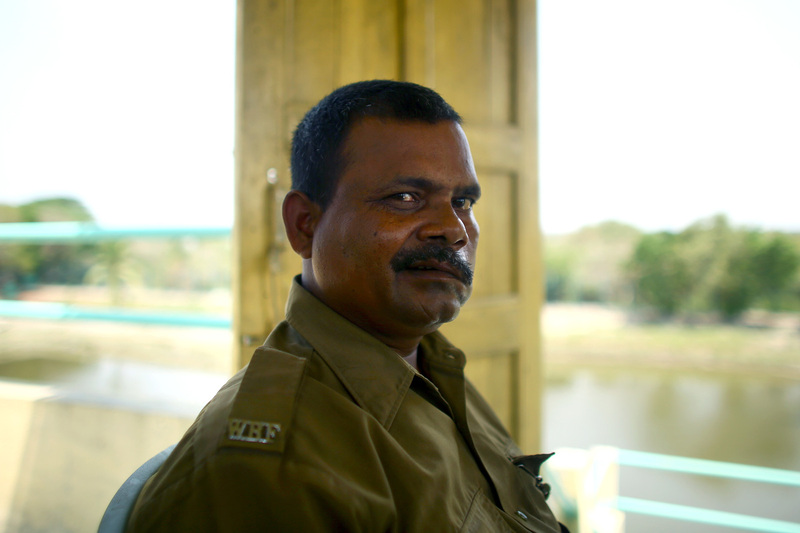 Three months after the attack, Mondal was back on patrol. He bears no ill will toward the animal that attacked him. "No," he says. "We are here to save the tiger. It gives us life. I have to be careful. And teach others to be careful. But I don't have any anger towards the animal." The tiger is an integral part of the forest, he says. "I believe that if the forest is destroyed, man will not survive. We have to save the forest, the tiger, the trees are our life." Already, an average of 25 people on the Indian side of the Sundarbans are attacked every year by tigers. Some experts warn that climate change will lead to even more tiger attacks. With every high tide, a huge amount of land in the Sundarbans disappears, says Saghal, the editor of Sanctuary Asia. Rising seas mean the land will shrink even more. Tides are taking away chunks of land that don't return. "So tigers, people, everybody gets squeezed into smaller land areas," he says. "When fields and farms and residential areas get completely unusable and people try to move into tiger habitats, there is an inevitable clash [that] is going to take place. People will die; tigers will die." In the village of Rajat Jubilee, people depend on the jungle for food and income. Sometimes they ply the coastline for crabs or go deeper into the forest for honey. And activities like that can make them vulnerable to tigers. "I've seen my friends being caught by the tiger. And some of the women in this village have been widowed because their husbands were taken away by the tiger," says Arjan Mondal (who is not related to Debnath). He has worked as a fisherman here for 20 years. We sit in his dusty courtyard outside a mud brick hut, surrounded by tropical fruit trees and a small plot of vegetables. A line of well-trained ducks from his pond waddles by to eat out of a bowl. Mondal tells us that three times when he's been fishing out in the jungle, a tiger has crept up on him and he's had to fight it off with a pole. Over the years, villagers have tried different ways of preventing tiger attacks. At one point, they made special backward-facing masks with a face to wear on the back of the head. People thought this would confuse the tigers, since cats like to sneak up on people from behind. Arati Sardar sits in her house with baby Sridoy. One of the family's goats was taken and eaten by a tiger, but having electricity now helps keep the home safer. Sometimes the animals even venture into this village, searching for a meal. Arati Sardar, who lives in a hut near the river with her children, raises bees for honey and keeps goats and chickens for food. One morning, she woke up to find that a goat was missing. "So when we came out of the house, we saw the track marks and we guessed that it was a tiger," she says. "Later on, people who were near the river found blood, and everybody knew that the tiger had come in to take the goat." The World Wildlife Fund came up with a plan to allow people to make a living in the village instead of foraging deep in the jungle — and scare tigers away from villagers' homes. It's a solar energy project, run via a power station on land donated by the local community. 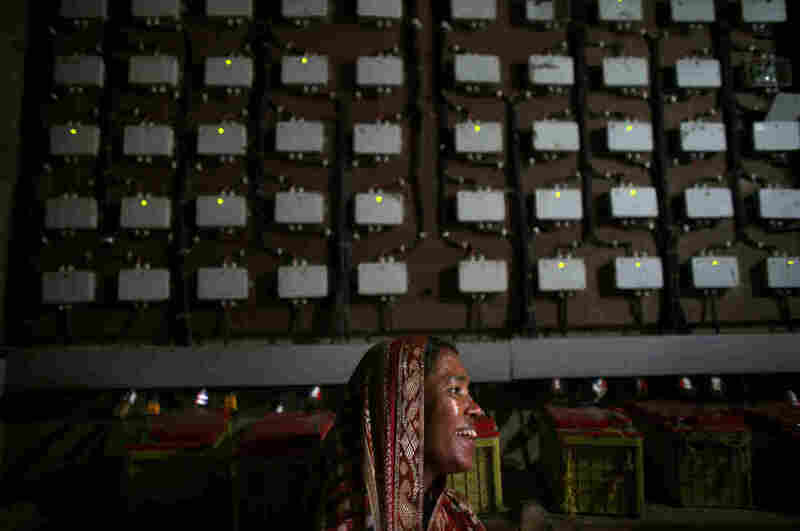 "If the people are accessing the clean energy, you have time to spend during the evening and also during the day because it gives you opportunities to do different livelihood activities than they were doing," says Ratul Saha, who runs the Sundarbans program for the World Wildlife Fund-India. "Spending less time inside the forest means less exposure to the tiger." Beyond this, having light deters tigers and other wildlife and means people can see their own surroundings more easily. Renewable-energy experts hope that underdeveloped places like this can skip straight to clean energy without ever relying on fossil fuels, in the same way that they got cellphones without ever depending on landlines — "leapfrogging" technology. 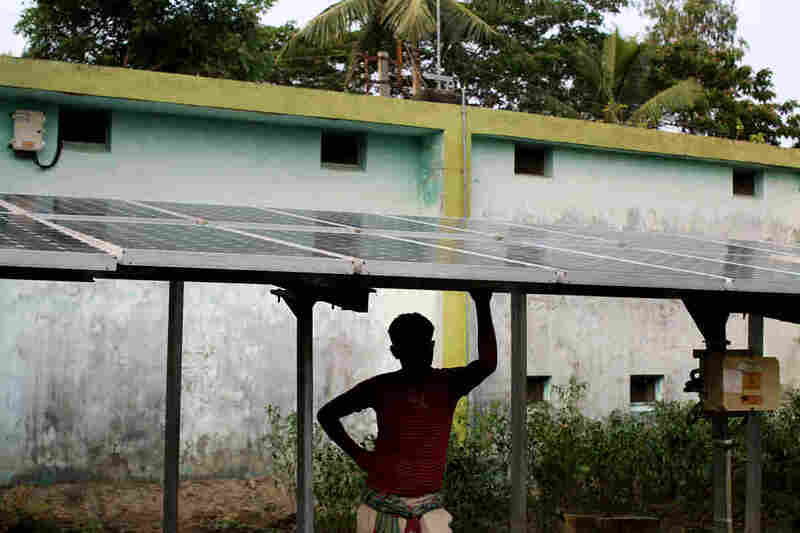 Solar power arrived in this village about five years ago. Until that time, people lived pretty much the same kind of lives their grandparents did. Nighttime lighting has changed everything. The fisherman Mondal no longer has to venture far away from the village. The women in his household make products that they sell at the local market. They don't have to set aside their weaving or embroidery when the sun goes down. 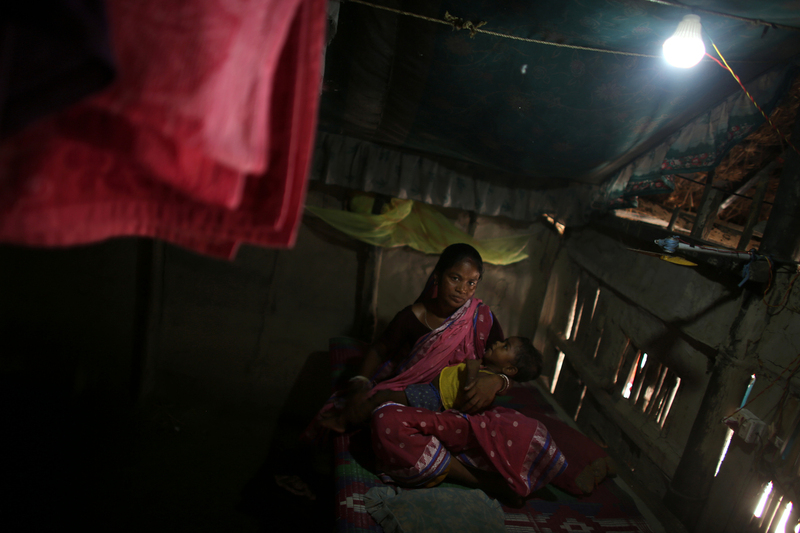 Before solar lighting came, people tended to stay in their huts after dark. There was nothing to do outside, and you might get bitten by a snake or attacked by a tiger. Now, when the sun goes down and the air has cooled, this little village completely comes to life. Each of these little shacks has opened up for business, each one with a bulb hanging down from the ceiling. "I've got cellphones here, printers — it's a cybercafe," he says. He says this is like a little city now, it's a business hub. He's wearing a digital bracelet like a Fitbit that sends his health statistics to his smartphone: heart rate, number of steps he's walked that day. Mondal says his parents and grandparents don't understand this at all. But they do understand that this shop has made him financially independent, without having to go into the jungle and cross paths with a tiger. And over at the hut of Sardar, who lost the goat to a tiger, her 17-year-old daughter Ria can now study after dark without having to rely on dim, smoky kerosene lamps, as she used to. "What do you want to be when you grow up? What do you hope your life will be?" I ask her. "I want to serve human beings," she says.